When I was a kid, I watched a ton of Thomas the Tank Engine. This ongoing series of stories about talking locomotives was about as English of a show as you could have - the thickly-accented Ringo Starr was the narrator, the setting of the Island of Sodor was a fictional British Isle, and the dialogue used a ton of slang and terminology from land of Queen Elizabeth. As a result, when I was in the single digits of age, I often referred to trucks as "lorries," railroads as "railways," trash as "rubbish," and anger as "getting cross." I know - I was so cultured as a child. What happened? Speaking of such linguistics, yesterday I got cross while at work. No, a student didn't give me attitude, a co-worker didn't leave my computer lab in a mess, nor did track practice go poorly. In this situation, getting cross was actually a good thing. I got Jeff Cross into my Cubs All-Time Roster Collection by submitting a best offer of a couple bucks on a Ebay listing that kept getting re-listed. Perhaps the seller was a bit "cross" that he couldn't move Cross? 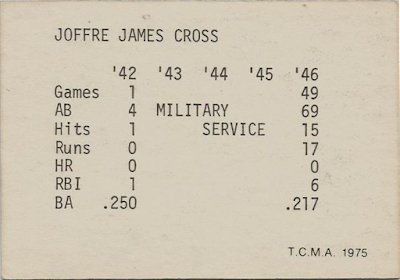 One of middle infielder Jeff Cross' only baseball card appearances comes courtesy of oddball overlords TCMA, via a team-centric checklist, in the year 1975. The no-frills set in which Mr. Cross appears is one that honors the St. Louis Cardinals of 1942-46. Why that particular, seemingly randomly selected time span, you ask? Well, those dynastic Cards managed to make it to the World Series in four out of the five years, while winning three rings along the way - not bad, eh? Here's hoping the Cubs' current run extends to the point of rivaling those Redbirds! And this is where I learned that Jeff was short for Joffre - I think I'd go by Jeff too, if I were him. As you can see, most of Joffre's... errr, Jeff's.... inactivity in the Major Leagues during this time was due to the call of Uncle Sam. 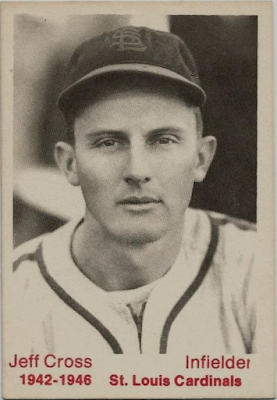 After making his MLB debut with a single game cameo in '42, Jeff (like many a baseball player) was drafted into the business of killin' Nazis for three seasons. 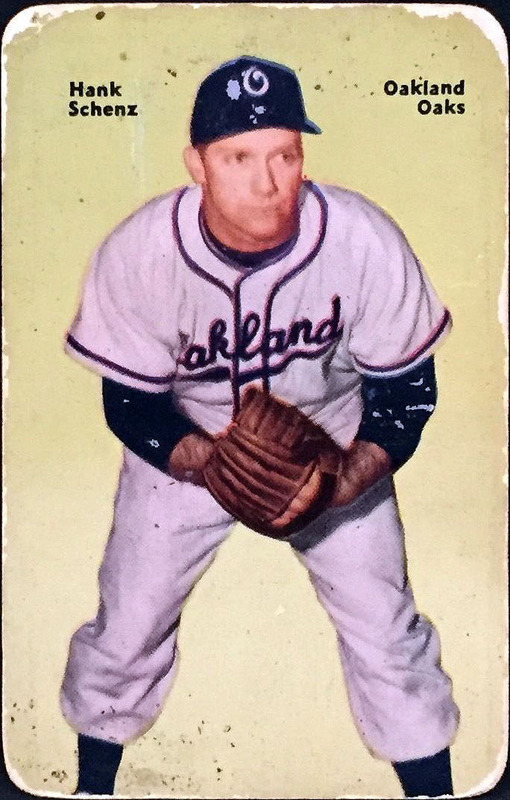 Eventually, he made his return to baseball during the 1946 season, but failed to lock down a regular spot on the St. Louis roster. As you can see in the stat-line above, the 27-year old utility man batted an anemic .217 in his return to baseball duty and things only got worse from there. Cross crossed under the Mendoza line (waayyyyyy under), barely cracking .100 during in the next campaign. Yikes. Someone managed to snap a picture of Cross in a Cubs uni. 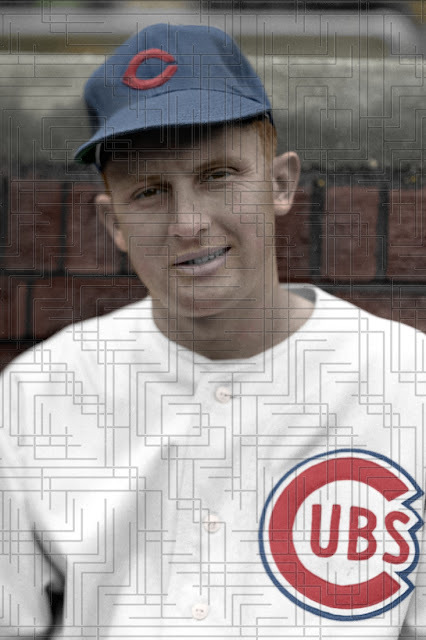 Nevertheless, the Cubs came a-callin' in 1948, purchasing his contract from their National League rivals that May. Chicago found themselves with a bit of black hole at second base, after having demoted their main starter for the decade, Don Johnson, to the minors. The Cubs gave Cross one last shot in the Bigs, to claim a vacant role, as he, Hank Schenz and Emil Verban duked it out to man the keystone. Unfortunately for him, Jeff did not seize his moment, again flailing to a .100 batting average in 20-at bats. Spoiler alert - this star-crossed middle infielder didn't win the three-way race. Schenz saw most of the action in '48, before giving way to Verban for '49. Cross' competition up the middle with the Cubbies. Meanwhile, Jeff Cross was promptly banished to the bushes after his brief, 16-game trial. 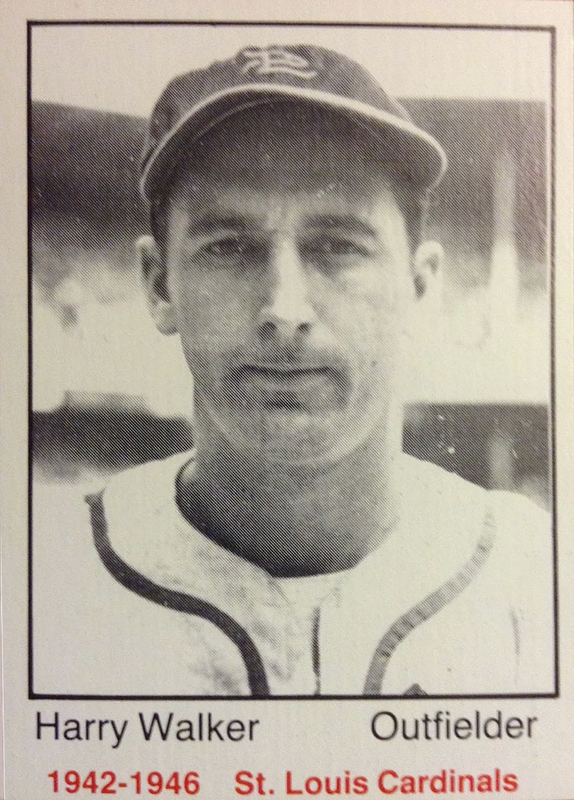 He was sent to the Texas League Shreveport Sports where he made his final 81 professional appearances. At season's end, the now 29-year old officially bid the diamond adieu, never again taking the field in the Majors or the minors. After retiring from baseball, the newly minted private citizen planted his roots in Texas, where he worked for forty years in the insurance business out of Houston. Cross retired in 1988 and passed away at the age of 78 on July 23, 1997. Back to baseball cards, as you can see above, Cross isn't the first card from this set that I've obtained. Apparently, the Cubs raided the Cardinals waste bin a few times in those days, as his teammates Coaker Triplett and Harry Walker will attest. 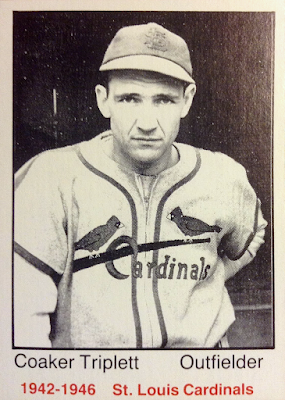 With crossing Cross off of my needed list, his card becomes the third from the 1975 TCMA 1942-1946 St. Louis Cardinals checklist to enter into my binder. That seems like a lot for such a niche offering, to me anyway. The cards themselves are, like most offerings from TCMA, quite basic. By that, I do not mean that they wear UGG boots, yoga pants and sip from Starbucks cups in their free time; no, what I'm trying to say is that there isn't much to the design of the product. Black and white picture, cream-colored border, name, position, and set title - the anti-Pacific, if you will. The backs are especially sparse, featuring the player's full name and stats from the declared period in what appears to by typewritten text, with no bio or any other extra flare. I can almost hear the cards saying, "just the facts, ma'am." 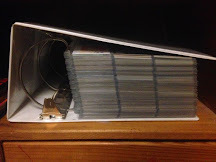 With that, the facts are that I was anything but cross about tracking down the Cross card for my CATRC binder. After watching that listing come and go for several months, I finally submitted a best offer that I was comfortable with and now it will be mine. Patience is a virtue, right? When I receive my winnings and insert Jeff into my binder, I will have 1,484 out of 2,055 Chicago Cubs in my collection; that's good for a 72.21% completion rate. My next goal is to "cross" the 75% mark. Also, to use more international puns. I apologize in advance - you can blame Thomas the Tank Engine. Pardon my odd focus but I was taken by Emil's shoes which look like they would fit on a basketball court better than on a baseball diamond. Congrats on crossing another one off your list. "Congrats on crossing another one off your list." Watch out for those Troublesome Trucks!